Twelve Teas to Remember includes ideas for hosting monthly themed tea parties throughout the year, afternoon tea menus and recipes, tips and tricks for making your tea party special. 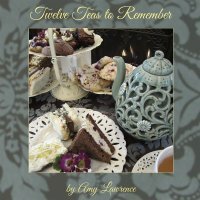 Twelve Teas to Remember is a soft cover book with lots of pictures, menus and recipes. Price includes free shipping in U.S.